I was in San Diego for business and before things got started, I snuck over to play Torrey Pines, South – site of the 2008 U.S. Open Golf Championship, where Tiger won in a playoff against Rocco Mediate. The place was beautiful, having wonderful practice putting greens and friendly staff. And it is clearly a municipal public golf facility. No pretense or prestige. Welcoming to all. Loved the course and the views of the pacific. It reminder me a lot of Kingsbarns. Playing from the Whites, measuring 6,628 yards, doesn’t seem all that long, but the prevailing breeze off the ocean can really make for some long tough shots. The element that struck me as the most challenging, were the numerous and strategically placed bunkers. Off the tee, I was consistently try to avoid one, but had another to consider. The greens are well bunked too. And huge & deep. 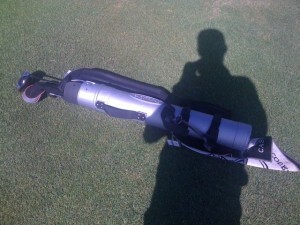 Greens were in good shape, and putts broke a lot more than I could ever figure out. My only complaint is that there is very little drinking water on the course. There is only a dinky fountain at the turn, and no where else. I paid $183 and walked on as a single after only waiting 60-minutes at mid-day on a Thursday. I think I was a little bit lucky. Shot 90 with one birdie, a few pars, and a lot of bogies and doubles. 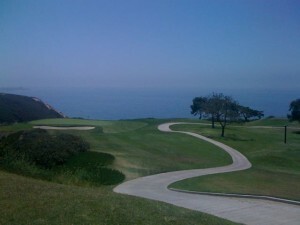 This entry was posted in personal, sports and tagged golf, torrey pines on August 26, 2011 by KB.